I read an interesting post today on Speaking of China about another blogger who concluded after one date with a Chinese guy that Chinese folks in general have weird dating standards. Speaking of China asked its readers to come up with their own blogs to refute the other blogger’s conclusions. This generalization is something I’m very aware of as I work on my memoir about my previous marriage to a man from China. But even more pressing for me, I worry how blanket statements like this affect my son. His father is Chinese, he has a Chinese name, and he identifies as Chinese. I know the media can have a devastating effect on kids. What they see on TV, YouTube, and in the movies seems more like reality to them than pure entertainment. But I also think these avenues can be positive for teens like my son. So this weekend I suggested we watch Johnnie To’s class Exiled, a Chinese take on spaghetti westerns, this one set in Macau. I hadn’t seen it, but Jake and I watched another Johnnie To flick set in Hong Kong and both enjoyed it. Exiled has a mostly male cast of movie stars I adore, so why not? The greatest thing about these movie stars is that they’re all older than I am. How cool to see these guys in their mid-to-late 40s and even 50s hit it out of the park in this high-stakes action movie? 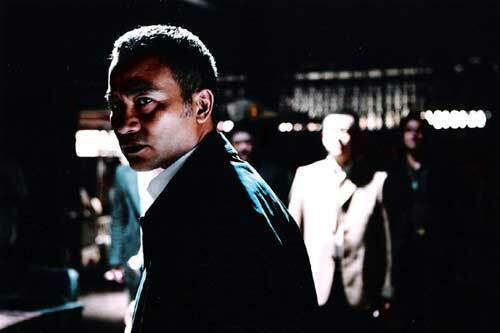 And then there’s Simon Yam, who was dreamy when I lived in Hong Kong in the 90s and hasn’t changed a bit. One of my favorite actors ever. Richie Ren is a Taiwan heartthrob who usually plays a silent stunner in Johnnie To flicks. Here he’s a crooked Macanese cop with a heart (and pockets) of gold. If you have any thoughts on this subject, I would love to hear them. I’m sure that your son will be absolutely gorgeous as he gets older, and fortunately the environment of stereotypes and negative reaction to Asian men is changing. When I was a girl (and I am only 23), people raised eyebrows at me liking Asian men. I didn’t think anything of it. Many of the cartoons and movies I grew up watching had interracial couples (Rugrats, Wild Thornberrys, Cinderella), so it never occurred to me that I was odd. I thought *they* were odd for questioning me. These days I don’t really face as much questioning. In fact, I get a lot of positive reactions, even in my native Georgia. I hear about how beautiful my children will be, as I am sure your son is. He has a bright future ahead of him. Stereotypes will always exist, it’s a fact of life. But your son faces a future where an increasing number of women of ALL races fully embrace Asian men. Thank you so much, Alice! I’m so glad to hear that you have positive reactions in Georgia. Thanks also for the website link. I’ve seen–and enjoyed–it in the past, but haven’t looked for a while. So thanks for bringing it back to my attention! I get chills. 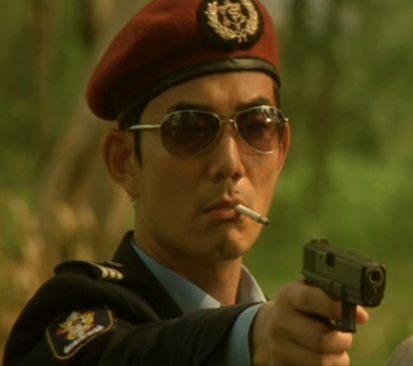 And Roy Cheung is the epitome of cool in this and in the first of the Infernal Affairs trilogy. Thanks for your comment! I haven’t seen that first Infernal Affairs movie in about six years. Time for a refresher! Roy Cheung reminds me of my first boyfriend in Hong Kong! Your kids are lucky to have such a thoughtful mother who’s attentive to the negative effects that popular culture may have on their self-image. As for Chinese movies featuring Chinese hearthrobs, I’d recommend “Turn Left, Turn Right”. Takeshi Kaneshiro (of Taiwanese-Japanese heritage) is a certified hottie among women in East Asia. Although, this movie might be a little too mawkish for your son’s tastes at his age, heh. Thanks so much for your kind comment! Popular culture can be negative in so many ways, so it sometimes seems like a never-ending battle, but thank goodness for positive movies. I feel like TV is a lost cause in the US. Love Takeshi Kaneshiro in the couple of Wong Kar-wai movies I’ve seen him in. Haven’t seen “Turn Left, Turn Right”, but I’ll check it out. Jake liked “Life Without Principle”, which wasn’t action packed (well, a little with the Lau Ching-wan segment). Sentimental is okay! And the same director too, Johnny To, who else. Cool! I haven’t seen “A Hero Never Dies”, but will put it on my list. Love “The Killer” and have seen in many times. They are Chinese movies, you’re right. Plus, more of the actors in those filmed by HK directors come from the mainland or Taiwan. It’s nice they all work together now. 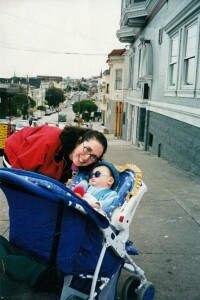 First of all, not to argue with your son, or anything, but I’m pretty sure he is Chinese-American, not Chinese! So funny about your conversation with your mom! Oh, yes, Chinese-American! Nice article! We have 3 half Chinese sons and now two beautiful 1/4 Chinese, 3/4 European granddaughters, all extremely good-looking if I may say (!) and they have had no trouble growing up in the Netherlands, where we now live. Our sons have Chinese names and are extremely proud of their Chinese heritage. Perhaps it all depends on the attitude of the parents too! Thank you so much! Your sons and grandchildren are so lucky to have you as their mother/grandmother! They all sound just delightful. I don’t doubt they’re stunning, too! It’s so good to hear that they’ve had no problems in the Netherlands. I think it’s a lot better now in the US than in the past. And, yes, the parents play a huge role! And double thanks for the interesting post on Asian stereotypes. My current world, as a Hong Kong-based expat, is awash in far too many generalizations and silly assumptions about “Chinese people.” Now I’m tasked with thinking of a thoughtful, funny response to remind people not to over-generalize. What a great comment. I remember my expat years in Hong Kong and feeling the same way. If you think of any good come-backs, I’d love to hear them! It would also make for a good blog post! Be still, my heart. Exiled is one of my favorite movies and some of my favorite actors are in it. When Francis Ng turns and grins after locking the door, knowing they’re all going to die, I get chills. 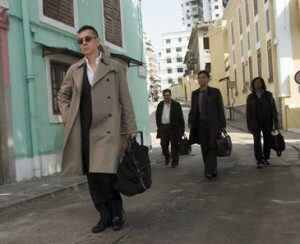 And Roy Cheung is the epitome of cool in this and in the first of the Infernal Affairs trilogy. I have no idea of what was written in the blog you refer to, but there are Chinese men I would crawl over broken glass to be with. Watch Infernal Affairs (all three of them) with your son–that trilogy is a hotbed of intelligent, handsome, cool guys with senses of humor. Thank you so much, Janet! I thought of you when we started to watch Exiled! I remember you praising it!! Roy Cheung was one of my favorites. Love the hair and can’t believe he’s pushing 50. I’ll take what he’s having. Great idea about Infernal Affairs. I watched the namesake movie years ago and loved it. A solid point Susan, and not one I’ve really considered but definitely should as a father to a half-Chinese son. It’s never really occurred to me that I should at least be considering providing him with some positive male Chinese role-models/imaging. Thanks so much, Ryan! It was hard for me to write this, but when I hear of people perpetuating negative stereotypes, it makes me sad. Half-Chinese sons are awesome. Anthony Wong is one of the lead actors in Exiled and he’s also half-Chinese. There’s some playful reference to that at the end of the movie. I think it was tough for him to grow up in Hong Kong when he did (he’s 51) but thankfully for our kids society no longer looks down on half-Asian kids (both in Asia and in the West). In fact, it’s quite the opposite!